16oz, canned on 12/03/2018. A tall and very frothy ivory head slowly fades atop an amber colored ale. Aroma is fruity, caramely, bready, and earthy. Balanced flavors: juicy fruit, bready crust, citrus, earthy pine, mango. Full body, moderate carbonation & bitterness, very dry finish. Really good beer here. Glad to try it while on vacation in California! 12/23/18 (Las Vegas, NV): $3.78 16 oz.single can w/ tax canned 6/6/18 purchased at Total Wine & More in Summerlin, poured into a large snifter. Brown golden pour, heavy carbonation, light head and lacing. 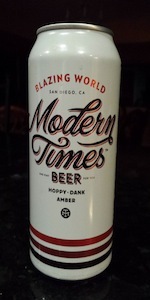 Very fruity hops aroma, lemon the predominant flavor, malty and bread aromas as well. Very dank fruity sweet taste, tastes like a nice ice tea with lemon, unique flavor. Light thin texture, carbonation lightens up quickly, Overall very good IPA. Freshest tasting amber I've ever had, tried to have alot of ambers and most are either nice easy drinking beers with light hops, this has a good hop character to it. This is my kind of amber...hoppy and toasted. The wheat backbone makes it light on its feet but it also comes with great hoppy flavors and a medium-dry body and finish that make it very unique. IPA +amber = this ale. Look- nice Carmel amber hue, with a decent yet quickly fading head and sticky lacing. Smell- funky sweet breads, stone fruits: light orange and grapefruit, roasted malt. Taste- a sweet roasted malt taste with dark funky citrus, dark cherries and raisin fruit hoppiness. A light grassy “dank” flavor with the light-to-medium wheat backing. Feel- medium-to-light body with some sticky hoppiness. Once again the wheat backbone makes an interesting background providing a toasty, bready sweetness to contend with the relatively strong hops. Overall this is a unique hoppy beer! It’s a fun winter IPA really. I can picture sitting around a fire sippin on this or preparing to go on a hay ride. I’ll buy again and again when I’m in the mood. As far as hoppy amber ales go this is a good one - well balanced, some caramel malt but also new school hop aroma and flavor. Lots of citrus, some tropical and a touch of pine.